In today’s milieu of crisp sound-bites, newsbreak a minute and short attention spans, the struggle to capture eyeballs and mind space of readers and viewers has become fiercely competitive. We, as consumers of news have become increasingly laid back and lazy, preferring our brains to be spoon-fed thoughts and ideas the anchors or journalists find fit to feed us. On the other side of the fence, newspapers and television journalists have become more and more imaginative to ensure survival. They have also, alarmingly, shifted the definition of their own role from reporting news to ‘shaping opinions’ – as this tweet indicates. I sometimes fear we further divide Kashmir from rest of India in tv studios. Need bridge builders not polarisers to shape public opinion. I find this thought alarming for, if the reporters, anchors and editors see themselves in such a role, who is to decide WHAT that opinion should be on a particular issue. And to what extent does such a role affect the judicious reporting of facts without giving it a subtle (or not so subtle) slant to suit the side towards which opinion is sought to be shaped. Of course, it’s not really possible to lie or fabricate facts to achieve this, without leaving themselves open to legal action. So the next best option is to ‘twist’ them. Instead of ‘the truth, the whole truth and nothing but the truth’, we get half-truths, opinions dressed up as facts, and their biggest weapon of all – misleading headlines. Capitalising on the tendency of the average news consumer to restrict their reading to the headlines, the message purported to be conveyed is cleverly crafted into it. That the rest of the story may not really bear it out completely doesn’t matter. It’s never going to be read most of the times anyway. As a test case, I took up a random page from the newspaper I subscribe to, the Hindustan Times (New Delhi Edition, Page 14, 14 August), to examine the headlines and see how far the stories bear them out. “Expert punch holes in Modi’s PoK plan” as per the first headline under the by-line of @jayanthjacob He starts telling the readers that the idea is not new and previous governments have been down this path earlier (therefore all this praise that the PM is receiving for it is misplaced and unfounded). He then goes on to quote the experts who, as per the headline have allegedly perforated the plan into a sieve. Maybe Jacob and I have different understanding of what it means to punch holes into something, but I couldn’t find a single expert quoted list a single flaw in the plan per se. All I found them doing is agreeing that it’s a bold move, and the challenge lies in now putting it into action. To my mind, any plan has challenges in implementation, and when it comes to a foreign policy initiative of such complexity, this is no great revelation. But nor does it construe trashing the plan itself. The second headline tells us, “Centre, state govt staff may soon have to wear khadi once a week to office”. The story by @meetuttam and Moushumi Das Gupta would possibly like to have us believe what an autocratic dictatorship that this government is turning out to be (we told you so) by passing such a diktat, which, obviously, the hapless government servants have no option but to comply with. Goes so well with the narrative of this government telling people what to eat, wear and do. That is the impression such a headline would leave someone who doesn’t bother to read the story with. Which is what, I suspect, 90% of the readers would do. Though if you do bother to do so, you will find that the Khadi and Village Industries Commission (KVIC) has written a letter to the central and state governments with this suggestion. Several state governments, including Uttar Pradesh, have liked the idea and have passed it on to their employees, it has NOT been made mandatory by any of them. The third headline goes, “Cong legacy doesn’t figure in govt’s I-Day celebration plan”. It’s difficult to figure out whether this particular gem is deliberately misleading, or simply a result of lazy reporting without even basic research. It goes on to inform us that Union Minister Narendra Singh Tomar would be travelling to Allahabad to pay tributes to Pandit Madan Mohan Malviya. Ministers would also be travelling to the birth places of other leaders, including Jayaprakash Narain, K Kamraj and the poet Subramania Bharati to pay homage to them. All these had been active members of the Indian National Congress during the independence movement, and in fact Pandit Malviya and Kamraj have been presidents of the party. So how can the headline be justified? Unless the newspaper or it’s reporter are restricting Congress legacy to the Nehru-Gandhi dynasty, which actually doesn’t figure in the plans. Considering that in the past so many years it was completely the other way around, one wonders how many articles were written in the past about the Congress leaders mentioned above being ignored. Lastly, a piece by @smritikak tells us “RSS to mark Akhand Bharat Diwas Today”. While you may be pardoned for giving in to images of jingoistic celebrations exhorting people to undo the partition and reclaim the whole of Bharatvarsha, if you are one of the few who do bother to read beyond the headlines you might feel let down. “We don’t believe in the merging of states, but there should be a meeting of people”, a senior functionary is quoted. Isn’t that also what the much hailed ‘Aman ki Asha’ talks about, as do people who want Pakistani artistes to perform in India and vice versa? 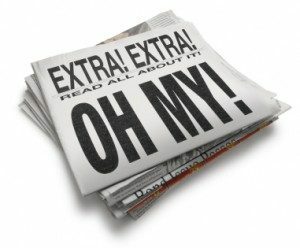 As educated, discerning consumers of news, we must therefore make it a point to look beyond the headlines to avoid being led like sheep by whichever school of thought your newspaper or TV channel subscribes to, our opinions ‘shaped’ like mindless minions that we are possibly imagined to be.